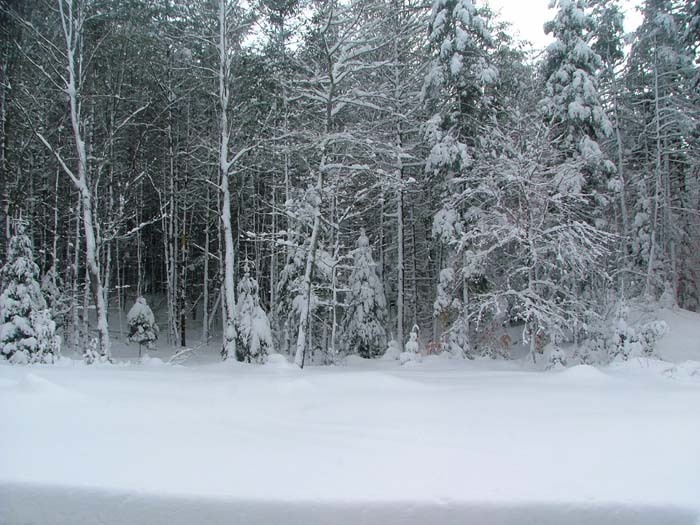 Cross Country skiing in the Lake Winnipesaukee area of New Hampshire is the ultimate exercise. It's a great way to be with nature too! A lot of people think cross country or nordic skiing is for the "granola" type of people. It's for everyone! Sometimes I only have a couple of hours and really want to take advantage of the snow cover, so I take out my xc skis and go. Because I live in an area with trails nearby, I can ski right from my yard. I first learned how to cross country ski in college. It was the same year I learned how to downhill. For some reason, the how-to-cross-country-ski concept stuck with me. I really enjoyed it and found some skis on sale for $10. I got the shoes pretty cheap too! I started going to golf courses and different trails throughout New England. I spent a lot of time with friends and really built up my stamina. It's easier to try skiing out where they rent equipment if you've never cross country skied before. When you decide to get your own equipment, you'll need XC skis, bindings, shoes and poles. These poles are different than downhill ski poles. You can't use the same ones. The XC poles are longer with a hooked point at the bottom. This helps you push off of each pole as you're going. You will also need gators for your shoes. If you don't have them, the snow gets in the shoes and you'll have wet feet. You can get goggles but sunglasses might be enough. A hat or head band, thin gloves and a light jacket that you can move in. Dressing in layers is a smart way to go as you will get warm as you go, then cool down if you stop for a rest or just to take in the views. The skis come in two styles; traditional and skate. The traditional skis are the most commonly used and are for a walking or stride style. They are great for either a groomed trail (some have ruts groomed in them) or just bushwhacking on the lakes and trails in the area. The skate skis are shorter and used in racing and for a good aerobic workout on a groomed trail. There are a variety of ski & bike shops in the Lake Winnipesaukee area of New Hampshire that carry the latest in cross country equipment and expertise in setting you up. If you are on a shoe string budget and do enough research into what your needs are or bring along a knowledgeable friend. You can set yourself up in equipment and clothes at one of the many ski & skate sales throughout the Lake Winnipesaukee region. These sales are generally held in the fall, so keep your ears and eyes on the papers and internet for information. Of course, having kids really changes things. XC skiing wasn't something to do on a whim. So, we got some equipment for the girls and took them. 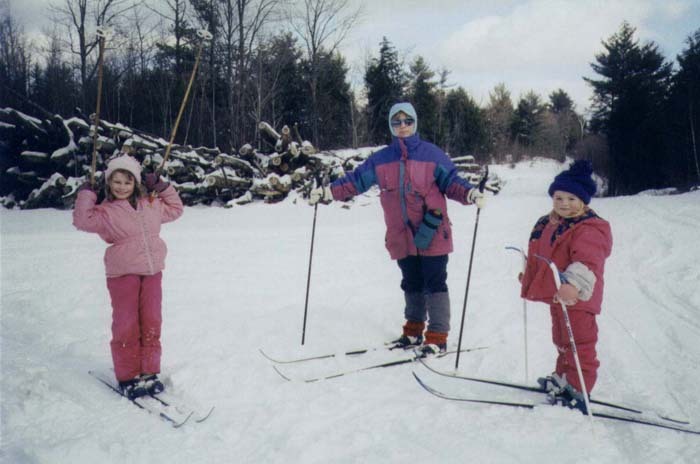 This was the first time I experienced being cold while cross country skiing in New Hampshire. I would always hear "wait for me". After an hour, the girls are hot and shedding their clothes and all I wanted was hot chocolate to warm up because I was just standing there most of the time. We tried this a few times (mostly in our yard) and the girls got the hang of it. At the age they learned, it wasn't that exciting and too much work. Now, they're ready to try out the real places around Lake Winnipesaukee in New Hampshire. I think I'll have more trouble keeping up with them instead of them keeping up with me. Generally, I feel better going to a place that has trails dedicated to cross country skiing. Gunstock Mountain has a great set of trails that will give you a real workout. Plus, women can get a free lesson on Wednesdays! 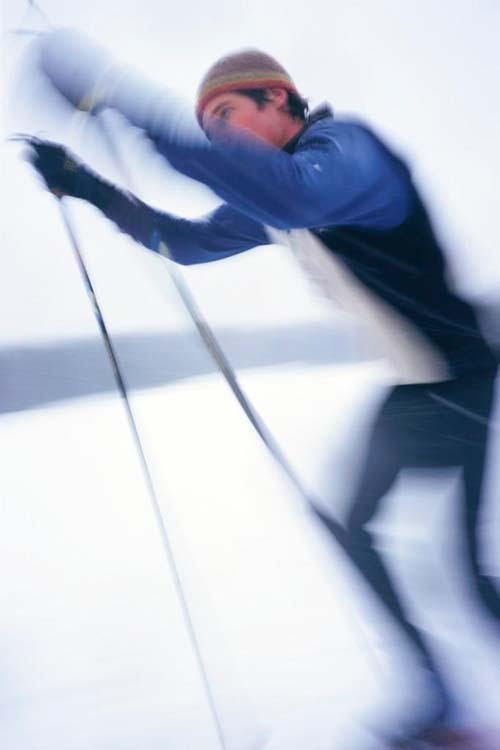 Wolfeboro Cross-Country Ski Association has a couple of places to ski. The Abenaki Trails and Sewall Woods. They are now joined by an internet trail. Abenaki has the more difficult trails and Sewall Woods has the easier trails and is good for the beginners. They offer some quiet, healthy cross country skiing. You can even ski in the moonlight. 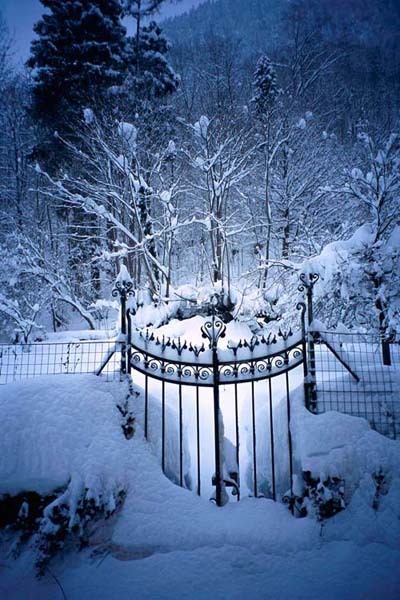 Since the moon is bright, closer to the earth and the snow is white - you can see where you're going. Even if you only go in the daytime, it's a fun way to spend time with your family or friends. In Laconia, New Hampshire, there's Bolduc Park. They have trails that go throughout the park. It's close by for most people, fairly easy trails and inexpensive. Not all places around Lake Winnipesaukee charge a fee. You can find golf courses, fields such as Gilford Field, parks and other areas around Lake Winnipesaukee in New Hampshire. Another option is to cross country ski across Lake Winnipesaukee. The lake almost always freezes. Depending where you are, you can ski over to an island and back. You can go on a lot of the extensive snowmobile trail system too. But be careful to listen for approaching snowmobiles. There is supposed to be a speed limit on a lot of the trails, but this is not enforceable in most cases and the snowmobiles tend to go much faster than the posting. If you do use the trails and hear a snowmobile coming, step off the side of the trail well before it approaches to let them by. This is one place where the pedestrian does not have the right-of-way. For those of you who are more daring or are advanced cross country skiers, try some of the summer hiking trails found throughout the Lake Winnipesaukee region of New Hampshire. 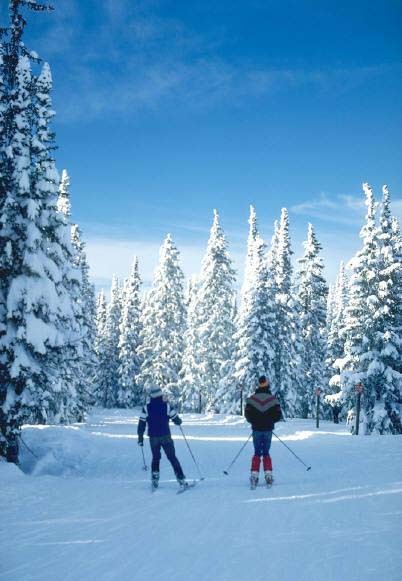 If you want some good exercise, be outdoors, don't want to spend a lot, then you should try cross country skiing in the New Hampshire region of Lake Winnipesaukee.